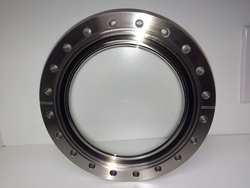 Schoonover offers vacuum viewports for high vacuum and ultra-high vacuum applications. 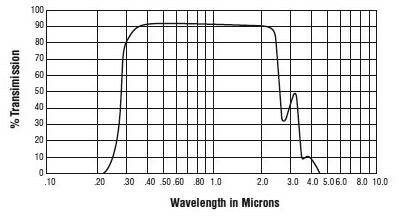 A number of window options are available to cover light wave frequencies required by many photonic applications. Options such as anti-reflective coatings are available upon request. Window sizing of vacuum viewports with provide viewable areas are up to 3 inches. Flanges can be weldable, ConFlat or Quick Flange (NW, KF & QF). 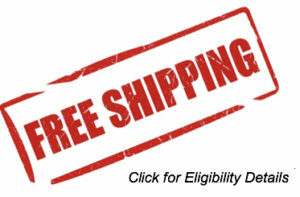 Custom capabilitie include pressure & temperature options. Also available are vacuum viewports with different optical finishes such as surface polish, flatness, parrallelism, clear aperature, wedge angle, focal length and thickness. Kodial glass viewports are manufactured from 304 stainless steel and alkali borosilicate 7056. Kodial glass allows for the operator to view a process, make measurements of emissions, and initiate chemical action from a specific wavelength. Usable to temperatures of 200°C. Fused Silica Viewports are available with diameters up to 8 inches and include zero length designs for low profile applications. These are all bakeable to 200˚C. Several standard grades of Fused Silica windows are offered and have excellent transmission from 193nm to 2 microns. Deep (DUV) Fused Silica Viewports are available with diameters up to 8 inches and include zero length designs for low profile applications. These are all bakeable to 200˚C. 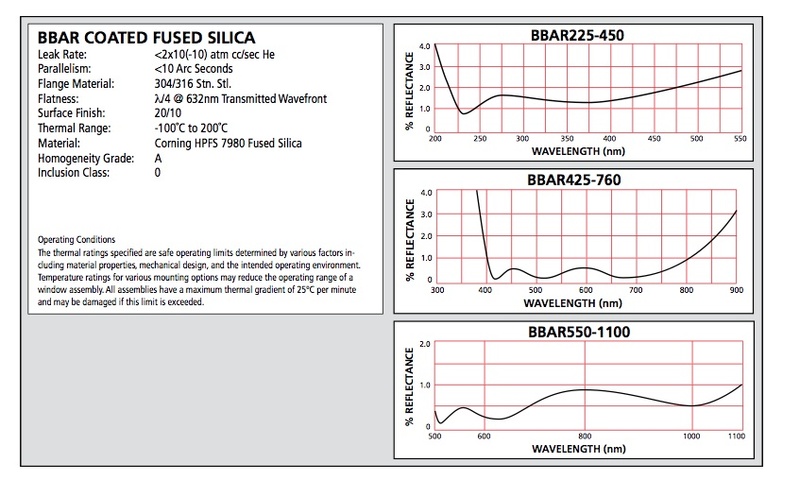 Several standard grades of Fused Silica windows are offered and have excellent transmission from 193nm to 2 microns. Eximer (EUV) Fused Silica Viewports are available with diameters up to 8 inches and include zero length designs for low profile applications. These are all bakeable to 200˚C. Several standard grades of Fused Silica windows are offered and have excellent transmission from 193nm to 2 microns. UV Sapphire viewports come with view diameters up to 3 inches, and are bakeable to 450˚C. Single crystal, sapphire windows come with orientation either 0˚ or 90˚ and provide transmission from 250nm to 4 microns. DUV Sapphire viewports come with view diameters up to 3 inches, and are bakeable to 450˚C. Single crystal, sapphire windows come with orientation either 0˚ or 90˚ and provide transmission from 250nm to 4 microns. Ultra-high Vacuum (UHV) viewports use materials for windows such as Zinc Selenide, Magnesium Fluoride, and Calcium Fluoride. We offer metal sealed (CF Flange) extended-range optics in 1 inch and 2 inch view diameters with a combined range of transmission from 120nm to 20 microns. Coatings, which enhance the transmission performance of many of these viewports, are offered as standard options. Laser Optics Fused Silica Viewports pair a specific type of Fused Silica with a precise AR V-Coating specified to your laser wavelength. These viewports are bakeable to 200˚C. 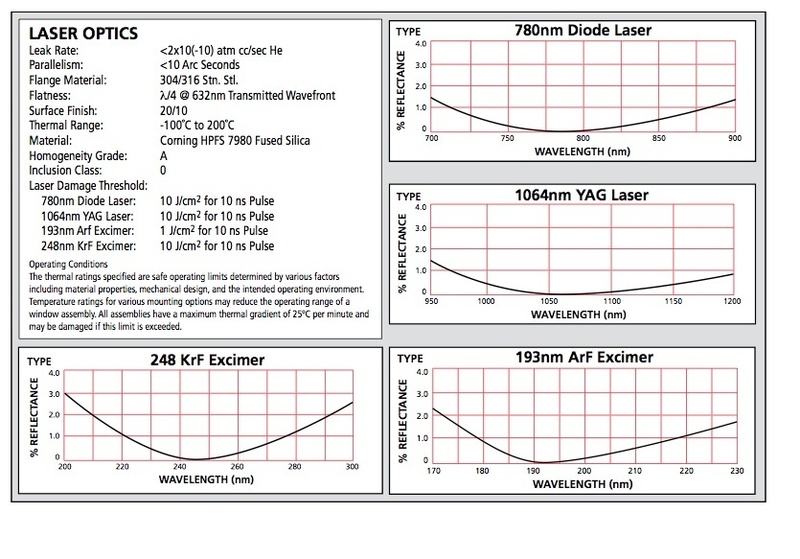 We have four standard wavelengths: 193nm, 248nm, 780nm, and 1064nm. If you need a wavelength, please contact Schoonover Inc. and we will assist you to get the best performing viewport for your application. BBAR Coated Viewports come with view diameters up to 2.69 inches. Viewports are BBAR Coated HPFS 7980 Fused Silica material. Viewports or vacuum windows can be specified with either 2.75” CF or 4.5 CF flanges. Differentially Pumped Viewports come with view diameters up to 1.88 inches, and are bakeable to 200˚C. Viewports are AR Coated Zinc Sulfide (Cleartran™) transmission range 8-12 microns. Viewports or vacuum windows can be specified with either 2.75” CF or 4.5 CF flanges. Our non-magnetic viewport selection include those manufactured with non-magnetic Stainless Steel or All-Titanium. All connections to the the vacuum system are Con-Flat for best seal. Choices range from bakeout temperatures from 200˚C to 450˚C depending on glass type and coating, Sapphire or Fused Silica. Re-entrant viewports come with view diameters up to 2.7 inches, and are bakeable to 200˚C. All flanges types are ConFlat, and all glass is fused silica. The stainless steel re-entrant tube is customizable in length for individual system needs.